Most potters are familiar with carbon-trapping: on shino glazes, in a typical reduction firing, or in wood, soda, and salt kilns. They’re also familiar with the process of creating conditions for heavy soot production to trap carbon on ceramic surfaces. Some covet black blossoms and spots on surfaces caused by carbon trapping as their most prized firing results. Learn how it happens, what causes carbon-trapping, and how to control it. Body Reduction: An increased-reduction period in firing in which oxygen access to the kiln is decreased, often resulting in early iron reduction in the clay body after inversion has taken place. Carbon Trapping: The action of trapping soot on a ceramic surface, often at high points or in spotted patterns and to varying degrees. Concentration Gradient: A range of high material prevalence to low material prevalence in any particular area or across a surface. Growth: The deposition of additional material to a nucleation site, often changing phase (from dissolved ions to precipitated solid material), which results in crystal growth as a solid material crystal expands outward. Nucleation: The first atom or central site of crystal growth, often at a high point or high concentration area, which is a transition from dissolved salt material to precipitated, solid material. Shino: A high-clay ceramic glaze that often has a substantial amount of soda ash in its formulation as both a flux and a facilitator for carbon trapping. Soda Ash: A somewhat caustic salt, soda ash is an aggressive flux, does most of the legwork in soda firing, and gasses off CO2, leaving behind mostly sodium oxide after being fired. 1 Two different shino vessels, fired side-by-side. Left: one week dry time, right: less than one hour dry time prior to firing. This results in two things: soda ash crystal patterns are grown that will control carbon trapping and glaze vitrification temperatures change. During the firing, soda ash is also pulled away from other places, effectively taking flux away from the areas where crystals did not form. Shinos represent a range of glazes that occupy many potters’ hearts. They are incredibly technical, complex, possess unmatched beauty in a wide range of colors, and still possess many facets that most do not understand. About the only thing that shino recipes have in common is their higher-than-normal clay content and presence of soda ash. They have a uniquely large amount of clay, which interacts to varying degrees with iron depending on the iron in the glaze or clay body, and almost all will trap carbon to some degree or another. Dichotomously, shinos with a low soda-ash content do not trap much carbon at all (Gustin Shino, 4% soda ash), whereas those with high soda-ash content (Malcolm Davis Shino, 16.3%) can trap so much carbon that the entire surface can turn black. These glazes are all fired in a gas kiln using a similar firing schedule: Candle at a low temperature for a few hours or overnight if possible. Fire the kiln in oxidation up to 1560ºF (849°C), cone 013, (ssshhhh, super secret tech here!). As soon as cone 013 starts to bend, decrease the damper opening or increase the fuel:oxygen ratio such that soot is being produced in the kiln at an earlier-than-normal body reduction. You can often see soot rolling up and out of the kiln. It will smell faintly of tar/creosote/greasy railroad ties. It is normal for the kiln to stall or barely climb in temperature at all during body reduction. This is the carbon-trapping phase. After around 45 minutes to an hour of heavy reduction, start opening the damper and increasing air access until a light reduction results in steady temperature gain. Maintain this soft reduction for the remainder of your firing, until cone 10 is softly bent. Note that most shinos are formulated for cone 9 maturation, as they were traditionally fired in saggars and were one cone colder than the rest of the kiln. Firing beyond cone 10 will occasionally destroy the bursts of color for which shinos are known. 2 Liners of shino vessels left: glazed a week prior to firing and right: glazed immediately before loading and firing. Take note of the carbon trapping, luster, and vitrification differences. The true workhorse of shino glazes is also one of the ingredients used in smaller amounts. Soda ash fluxes the glaze, helps manage the extremely high-clay content in all recipes, easily gasses off CO2, and does something much more interesting and less commonly known. Just like most salts, soda ash crystallizes when it dries. Akin to the salt patterns you see on the side of the road after a big snow (and resulting road-salting), soda ash forms salt crystals in shino glazes. These crystals form at the surface of the glaze and can vary in nature depending on how the glaze dries, which direction a breeze was coming from, the presence of wax on the surface, or by varying the length of time it was allowed to dry before being fired. Each of these effects will be different based on the amount of soda ash in the glaze. These crystals effectively allow carbon trapping to take place, directing where soot will stick to the surface and become those black blushes and blossoms on your fired work. 3 From left to right: salt crystals growing on the surface of the glaze as a result of drying. When a vessel is dipped in a shino glaze slurry, the still-wet glaze that adheres to the pot includes a dissolved solution of soda ash. The glaze will start to dry, with high points on the vessel losing the most water first. Here, soda ash crystals will form as nucleation sites for salt crystal growth. As soon as some small amount of solid salt crystals form, the remainder of the wet glaze will start to transport dissolved soda ash to the salt crystal sites (thermodynamically driven via a concentration gradient), effectively continuing to grow salt crystals as the glaze dries, until the dissolved soda ash has been consumed. This results in two things. Soda ash crystal patterns are grown that will control carbon trapping. During the firing soda ash is also pulled away from other places, effectively taking flux away from the areas where crystals did not form. 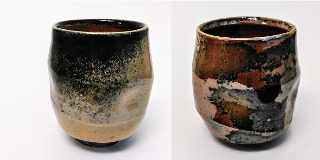 Interestingly, the inside of vessels glazed with Malcolm Davis Shino are flat, orange, and appear unfluxed, as soda ash migrates to the outside of the vessel during salt crystal formation and decreases the vitrification temperature of the glaze there. If glazed and fired immediately, only minimal soda ash is allowed to migrate to the outside of the vessel and the liner glaze is still shiny, gold, and vitrified. The melting point of soda ash is 1564°F (851°C) or effectively cone 013. That means that right at cone 013, where we talked about starting body reduction, soda-ash crystals are starting to become tacky and soft. They are starting to melt. Soot will stick to them and be absorbed into these freshly melted salt pools, which is effectively carbon trapping at the surface. The patterns of salt crystals that are visible on the surface of your dried vessel will be the same as your patterns of carbon trapping. The soda-ash crystals are what allow that carbon trapping to take place. This means that you can alter carbon-trapping patterns by spraying (and respraying, if desired!) salt-crystal formations with hot water until you get a pattern you like. You can vary the time you allow vessels to dry to modify carbon-trapping spot size, randomness, and even liner glaze vitrification if less soda ash was allowed to migrate to areas where salt crystals formed. You can start nucleation sites by dropping single crystals of soda ash onto vessels freshly-dipped into shino glazes. You can obtain vastly different carbon trapping and shino aesthetics by just glazing your vessels at various times, being mindful of the mechanism by which carbon trapping takes places, and finding new methods to control soda ash crystal formation. All glaze work, firing, and thanks go to the Visual Arts Center of Richmond. This work was informally requested and inspired by Al Pellenberg, a fellow instructor, at the Visual Arts Center of Richmond. the author Ryan Coppage is currently Chemistry Faculty at the University of Richmond in Richmond, Virginia. He teaches a Japanese Ceramics and Glaze Design class at the Visual Arts Center of Richmond and still makes far too many pots. To learn more, visit www.ryancoppage.com. body reduction, clay, damper, iron, oxidation, reduction, shino glaze, solution, spraying.